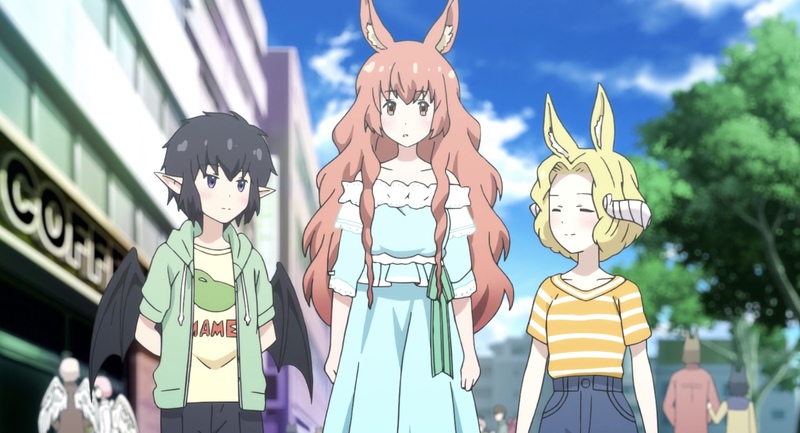 I finally have time to catch up on my anime reviews, and I am very excited to be reviewing A Centaur’s Life. Thanks again to Funimation for sending this my way! Our story follows a girl and her horse – er, a girl who is a horse, well…. A Centaur’s Life establishes an alternate reality where instead of races humanity evolves into different species of demi-humans. Centaurs, satyrs, mermaids, and cat people are just a few varieties of human life that exist. Our story focuses on Himeno Kimihara, a centaur girl who is going through the motions of life and school. Nozomi Gokuraku, a demon, and Kyouko Naraku, a satyr, are Himeno’s friends and join her in dealing with the ups and downs of school. Despite having extremely quirky group of classmates, there is little to no bullying at the school. This is owed in part to Manami Mitama, an angel girl who is Himeno’s class president. Manami makes sure all students follow the school and country laws regarding acceptance. Being discriminatory of a different species is enough to get someone arrested, potentially even put in jail. This particular law becomes difficult for Himeno to abide by when Quetzalcoatl Sassassul joins their class. An Antarctican, Quetzalcoatl is a snake humanoid, and her appearance causes a deep-rooted fear to emerge in Himeno. Himeno’s fear stems from a movie she watched as a child where the main villain was an Antarctican who stole the skin of different centaurs (similar to The Thing). This fear is resolved when the two sit down to watch the movie together and bond over how terrified they are. With the fear gone, Quetzalcoatl quickly becomes a valued addition to Himeno’s group of friends. Seemingly a slice of life anime from the outside, A Centaur’s Life actually gives off some unnerving dystopian vibes. One such instance is when Manami mentions that her halo is made of hair and she needs to be careful of getting haircuts. Incidentally, Manami did have her halo accidentally cut off and she needed to carry around a special permit to avoid trouble with the law. Another disturbingly dystopian incident occurs when a character experiences a flashback to their time in a concentration camp. It’s unclear how or why this holocaust occurred, but it was certainly jarring and a huge deviation from the normal feel of the show. While A Centaur’s Life wraps up most of its plot points, there are still many things left unanswered. It’s never fully explained why Quetzalcoatl has bodyguards that follow her around everywhere. Speaking of Antarcticans, it’s also never explained why they interrupt a mermaid ceremony with a robotic false god. Or what happens with their feud against the Americans. Given that the manga is still ongoing, I’m sure the answers are in there. For anime fans like me though it’s a little disappointing to have these seemingly major events go unresolved. For all of its plot problems, A Centaur’s Life does a good job fleshing out the characters. Both Himeno and Manami have extremely detailed lives outside of school. They have family dynamics that are introduced and reflect in their personalities. Even their families have established personalities and interactions with the two and their friends. It’s a little additional world building that makes a whole world of difference when it comes to feeling like a well-developed anime. Along with the characters having extremely fleshed out lives and personalities, the characters are all extremely unique looking. The creators did a good job designing each character to look distinct. In the case of Himeno and Manami, the two are unique characters with physical attributes similar to their family. This anime definitely avoids making the protagonist the standout character and I commend them for that. With all of the interesting looking characters you’d think the packaging would be more dynamic. However, the discs and the cover are a little…bland. The cover has our main trio of friends, but the reverse only has a horseshoe and Himeno. The discs have a cute little pattern, but it’s nothing like what I was hoping for. Fans looking to add A Centaur’s Life to their anime collection can purchase it here from Funimation.